If you’re a business owner whose online presence is built on WordPress, we have some bad news for you: You are using the business equivalent of a VCR while your peers are streaming video on their smartphones. It’s time to give up WordPress and move into the 21st century, and here are 10 reasons why. 1. If you’ve ever had your site hacked or infected with a virus, you know what a horrible, time-consuming experience it can be. Expect more of it with WordPress because it’s the most vulnerable platform in the world. Those themes and plugins that seemed so nifty are often back doors for black hats. While the concept of open-source software is great, in practical terms it can often mean open season on your site. Your source code is available to anybody who wants it. 2. Recall, if you’re old enough, the days when WordPress first became popular. It was a blogging platform. And the modern version of WordPress is still a blogging platform. These days it functions like a web platform by allowing you to interact with customers instead of just throwing blog content at them, but those interactions are enabled by workarounds. It’s as clunky as you would expect continually updated blogging software to be. 3. It took WordPress 15 long years to release Block Builder, and it works just fine for people who don’t mind building a site they can’t actually see until it’s finished. Using Block Builder is a bit like trying to paint a specific image while wearing a blindfold. You can take the blindfold off to see your mistakes, but you have to put it back on in order to fix them. It might make a good parlor trick, but for most people, it’s a dumb approach to creating a desirable finished product. 4. Important tools for business growth are not a default part of WordPress. You’ll need a skilled techie to install, configure, test, and maintain the components that make WordPress an acceptable business platform. Even the best WordPress wizards often rely on free, poorly coded plugins to create a functional business site. Alternatively, those wizards can utilize slightly better but still poorly coded plugins for a monthly fee. 5. WordPress was designed to run on shared web hosts, which do offer sentimental value but little else. We loved the ‘90s, when The Terminator governed California and everyone thought Chumbawamba would continue to churn out catchy, sing-along odes to drinking, but we eventually grew up. The Internet grew up too, and these days, shared hosting is the most unreliable, unsafe way to host a website. It’s also slow. We use Amazon’s Web Services for hosting and enjoy lightning-fast speed and reliability that approaches 100%. Its VPS-style hosting also makes it incredibly secure. 6. To be fair, WordPress does have one advantage: It’s free. And it certainly gives new life to the old adage, “you get what you pay for.” Along with a free WordPress installation, you’ll get MySQL database corruption and thousands of spam comments to wade through. If you’re looking for a big financial break, you’ll have hundreds of emails offering you Western Union-based business opportunities from entrepreneurs in exotic locales like Nigeria, India, and Russia. If this sounds a bit cynical, it should. Free is not always good. 7. WordPress requires constant maintenance, and we discovered that the hard way. Back in the days when we used to offer WordPress sites to out clients, we spent countless hours engaged in the Sisyphean task of making sure all sites were updated with new versions of themes and plugins. Worse than that, we had to make sure that those newly updated components actually worked with WordPress itself. Some clients would request that we build a site and then hand it off to them to maintain, and this caused no end of sleepless nights. WordPress websites can break if they are not maintained, but they can also break if they are maintained improperly. Tiny mistakes on the back end can lead to catastrophic failure. Seemingly simple updates can crash an entire site. We eventually realized that we had missed out on twice the opportunity cost of those projects by wasting time fixing clients’ mistakes. Thanks, WordPress. 8. Time is money, and WordPress burns through them both. If you’re neither immortal nor in possession of a vault full of gold coins, you don’t want to waste precious time building and maintaining your business website. Far too many plumbers, photographers, and lawyers spend hours moderating comments on blog posts and updating plugins. 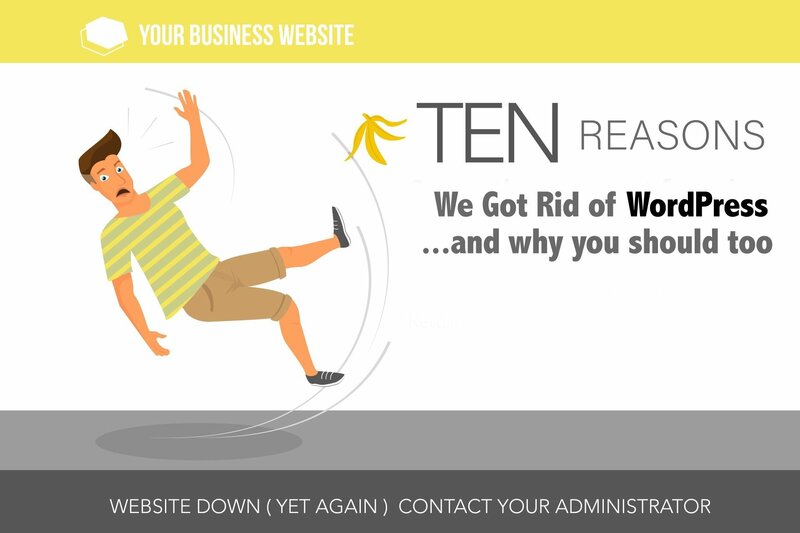 In worst-case scenarios, they end up paying big bucks to have techies bring their dead business sites back to life in the shortest time possible. 9. WordPress enables unscrupulous web design companies to trick you into paying more than you should. By now we’ve established that WordPress doesn’t maintain itself, and even a functioning WordPress site is anything but trouble free. Sadly, there are companies who use WordPress specifically because they know it will eventually break. When it does, they can simply blame WordPress. Or they can blame the client. Since business owners are rarely experts on network hardware and protocols, they can even blame the Internet. The problem will certainly not be the designer’s fault, but they will be more than happy to fix it for you at an exorbitant hourly rate. Our clients’ websites work because we manage our AWS servers daily. Our AWS hosting partner has 135 American employees, all experienced and conscientious adults, who work to make sure that your site is up and running smoothly at all times. The shared hosting service and site design from cheapsites.com may seem like a good deal, but if the company is based in a country you can’t point to on a map and they tout the virtues of WordPress, you’ll pay more in the long run. Extra charges are built into their business model. 10. People are often led to believe that using WordPress will help with their search rankings. It won’t. Any web-building tool, including the discount tools used by starving artists, cat bloggers, and conspiracy theorists, can achieve high rankings by utilizing SEO best practices. Don’t let anyone fool you into believing that using WordPress is a necessary part of SEO. WordPress was an excellent tool for bloggers whose primary interest was one-way communication with their audience. For anyone interested in interacting with site visitors, WordPress is a dinosaur. Business owners and solopreneurs need a web presence that doesn’t make demands on their valuable time. If your business is currently running on WordPress, we would love to take a look at your site and help you turn it from a time- and money-sucking liability into a lead-generating asset.